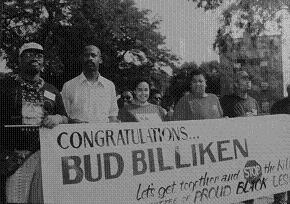 The committee was formed in 1993 to create positive gay and lesbian visibility in Chicago’s African American community and to march openly in the 65th annual Bud Billiken Parade. After filing and mediating a human rights charge, the group marched and was warmly received. Ad Hoc Committee of Proud Black Lesbians and Gays was organized specifically to participate in the 64th Annual Bud Billiken Parade, an event that is sponsored by the Chicago Defender Charities. This action was taken in memory of all the Black gays and lesbians who have come before, and who had to live their lives “in the closet” — Langston Hughes, Lorraine Hansbury, Bayard Rustin, Audre Lorde, James Baldwin and countless other Black gays and lesbians who have contributed to the development of African-American culture. The Ad Hoc Committee chose to participate in the Bud Billiken Parade specifically because it is a family event, and gays and lesbians are an important part of the African-American family. Of note, the Bud Billiken Parade is billed as the country’s largest African-American parade, if not the largest parade in the United States. The Ad Hoc Committee applied to enter the event well before the deadline, but its application was denied allegedly based on “space, time, and manpower constraints” according to the Defender Charities. But a virtually identical application submitted under the name “Diverse Black Role Models” one month later — and two days before the filing deadline — was granted immediately. The only difference in the applications was the mention of gays and lesbians in the first, denied application. Because the Ad Hoc Committee’s application was denied a second time in mid-July, it filed a complaint with the Chicago Commission on Human Relations alleging unlawful sexual orientation discrimination in the provision of public accommodations. The Ad Hoc Committee was represented in this action by the Lambda Legal Defense and Education Fund. In two days of mediated negotiations, the Ad Hoc Committee and Lambda convinced the Defender Charities to allow the group into the parade under the banner of Proud Black Lesbians and Gays, settling the dispute out of court. The Ad Hoc Committee marched near the front of the parade and celebrated themes of visibility, youth education and anti-violence, consistent with its mission to promote positive images of Black lesbians and gay men in the community, to increase visibility, and to respect and celebrate diversity in all its forms. During the period June through August of 1993, the Ad Hoc Committee’s membership included Stephanie Betts, Julianna Cole, Karen Hutt, Saundra Johnson, Janice Layne, Karen Long, Lisa Marie Pickens, Stephanie Stephens and Valerie Lopez. Also, Robert T. Ford, Michael O’Connor, Michael Harrington, Michael Norman Haynes, Michael O’Connor, Maxsonn Smith, and Shelton Watson. The Ad Hoc Committee, having served its purpose, has disbanded. Already, however, their historic action has paved the way for the non-controversial inclusion of Hispanic/Latino gays and lesbians in the Mexican Independence Day Parade.